Recently, the large limestone powder production line in South Africa has been officially put into operation. Reportedly, the main configuration of the production line are two sets MTW175 European Trapezium Mill. The plant capacity can up to 30 tons per hour, far exceeding customer expectations. The main component of limestone is calcium carbonate. 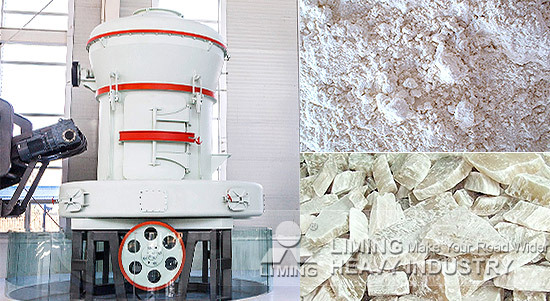 lime and limestone is used extensively for building materials, industrial raw materials. Limestone Mohs hardness is 3. As the large raw size, we configured the whole production line including jaw crusher, elevator, feeder and two sets MTW175 European Trapezium Mill. According to Technology Center engineer, MTW Series European Trapezium Mill absorbed the latest technology and ideas of Europe. It have overall drive bevel gear, internal lubrication system, arc air channel and other a number of independent patent property rights, is the fourth generation of upgrade product of Raymond Mill and pendulum grinder, is also the delegate of efficient and productive grinding equipment. In addition, the unique operation of the system and supporting advanced dust, dust removal efficiency of 99.9%, which can be realized without dust. Whether production or environmentally friendly are in line with customer requirements. customer prepared two additional sets recently.